G-Core Labs is a Luxembourg based global IT solutions provider offering managed hosting, CDN and cloud services. They have built out an unprecedented IT infrastructure for an industry leading game developer, Wargaming, and as a result, have also become the World Guinness Record holder for "Most Players Online Simultaneously on one MOG Server — 1,114,000 online players". To ensure they can continue to scale mission-critical infrastructure in a cost effective manner while meeting the stringent performance demands of massive real-time data traffic, G-Core Labs rely on Megaport’s elastic interconnection services to future-proof this key company asset. Consistent service delivery with the highest throughput and lowest possible latency for Wargaming’s flagship Massive Multiplayer Online (MMO) game "World of Tanks" directly translates into great user experience. Providing high-quality online gaming experience is challenging due to the best-effort nature of the Internet. Thus the need for robust and resilient interconnection, which keeps Round Trip Time (RTT) and packet loss to the possible minimum, is essential more than ever to support a growing base of richer game versions and diverse users in the APAC region. Depending on the time of day and year, traffic can fluctuate drastically. Daily peak time is typically between 19:00 and 22:00 local time when most players come online, with an even higher peak during major holidays like Christmas and summer break. With traditional means of bandwidth sourcing, G-Core Labs has to anticipate, pre-provision and commit to larger amounts of bandwidth in order to meet peak end-user demand. 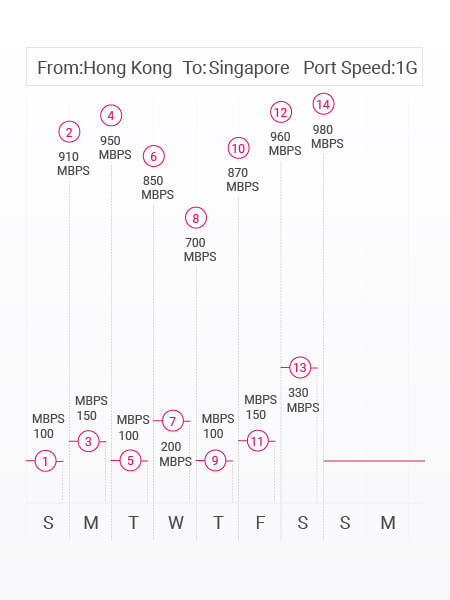 This inevitably drives overall connectivity cost up and is of particular concern where international bandwidth costs in Southeast Asia run high. Megaport helped G-Core Labs solve the challenges regarding network performance, cost efficiency and flexibility by enabling them to consume right-sized, scalable connectivity in an on-demand and cost- effective manner between key Point Of Presences (POPs) in Asia Pacific region. For example, a 1-week cost comparison with daily peak of 3 hours results in 82% savings! Minimize Latency: The Hong Kong — Singapore elastic connectivity directly helps to eliminate traffic detours otherwise necessary between these two key markets. G-Core Labs is therefore looking to Megaport to elastically link-up other key markets in region as well. Megaport is the world’s leading Network as a Service (NaaS) provider. Using Software Defined Networking (SDN), the Company’s global platform provide the most secure, seamless, and on- demand way for enterprises, networks, and services to interconnect. The Company’s extensive footprint in Australia, Asia Pacific, North America, and Europe, provides a neutral platform that provides for over 700 customers, and spans 170 data centres across 41 cities.